Apart from its delicious brats, curds and eggers and its tranquil park-like setting, Road America is really here to ruin your day. 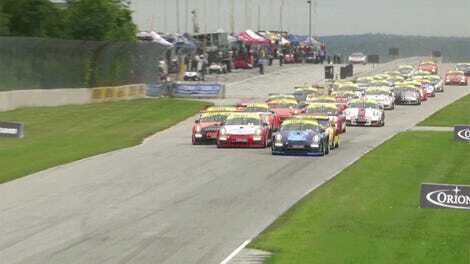 A small bump ended in a huge flip for two cars during yesterday’s Continental Tire Sports Car Challenge race. Road America does not care. Road America has no mercy. Trent Hindman in the No. 12 Bodymotion Racing Porsche Cayman GT4 was in the process of going around the outside Paul Holton’s No. 76 C360R Ford Shelby Mustang GT350R-C to take second place just before Canada Corner. The two cars then made contact as Hindman tried to cut back onto the track, sending the Mustang into the No. 35 C.J. Wilson Porsche Cayman GT4 of Til Bechtolsheimer. Both cars whacked the wall, putting Holton on his side and turtling Bechtolsheimer’s Cayman. It’s a cruel, cruel world when a Cayman gets knocked out just for being in the wrong place, at the wrong time. Never tempt Road America. Road America doesn’t need to be prompted to bend every body panel on your car. It does as it pleases, which won’t please you. Just remember: you may think of Road America as pure Wisconsin cheer, but we see through that friendly pile of deep-fried cheese straight to those car-eating walls. We know.